General Information: In an article for Saveur magazine, Peggy Knickerbocker wrote, "If angels sprinkled a spice from their wings, this would be it." 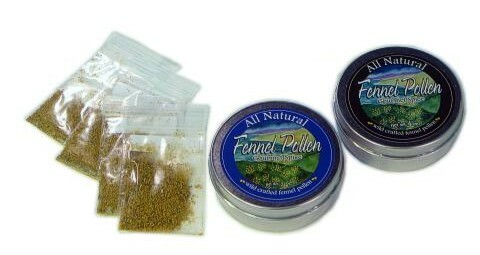 Long a part of the culinary tradition in Northern Italy, fennel pollen is capable of amping up flavor in an instant. After hitting the American market as a digestive aid, the green-gold powder worked its way into professional kitchens by the mid-1990s, and has gained a growing following. Its flavor combines the licorice zing of fresh fennel seed and anise with citrus and honey notes, but here's where the real magic comes in: Fennel pollen acts not just as a flavoring agent but as a flavor booster, instantly beefing up a dish's umami - that deep savoriness and intensity that chefs struggle mightily to develop.